Lately the man garners more press for his private life than for his professional one, but John Mayer would be the first to concede that music remains his greatest passion. On his latest release, Where The Light Is: Live In Los Angeles, which comes in both CD and DVD formats, he delivers a solid performance that works far better as an album than it does as a film. Recorded at the Nokia Theatre in Los Angeles on December 8, 2007, the 22-song concert is divided into three segments: an acoustic set, followed by a John Mayer Trio performance, and culminating with Mayer playing alongside his regular touring band. He melds this assortment of sounds, songs, and styles into an inspired, cohesive show overall. In the acoustic portion, his six-string dexterity emanates through on “Neon,” “Daughter,” and the rarely played “In Your Atmosphere.” As well, he offers a peaceful, easygoing take on Tom Petty’s “Free Fallin’” that's hard not to like. When Mayer suits up—literally and figuratively—with his Trio (rounded out by drummer Steve Jordan and bassist Pino Palladino), he summons the show’s most spirited, ambitious moments. Laying down a heavy dose of electric blues, he leads the band through originals like “Good Love Is On The Way” and “Who Did You Think I Was” while a selection of covers, including B.B. King’s “Every Day I Have The Blues” and Jimi Hendrix’s “Wait Until Tomorrow,” are played with palpable reverence toward the form. Though not as musically invigorating as his time with the Trio, Mayer nevertheless shines—especially on the guitar—when his touring band joins him for the concert’s final set. He plays in fine form on “Waiting On The World To Change,” “Why Georgia,” and a nine-minute, slow-burning version of “Gravity” that just about makes your jaw drop. Mayer’s performance is laudable by and large, but it doesn’t translate well in the way it's rendered on film. The presentation has a made-for-TV feel to it, coming off as excessively produced and bereft of the spontaneity that a live music document should convey. Adding to the visual artifice, the camera focuses more on Mayer’s lyric teleprompter and of other cameras around the stage rather than on the audience. Quite simply, it doesn’t capture the spirit of a genuine concert. Between the three concert segments, Mayer provides commentary whilst driving around town (presumably Los Angeles). Given the fragmented nature of the performances, the footage serves as viable (and often humorous) transitions, but unfortunately it breaks the continuity within some of the sets as well. 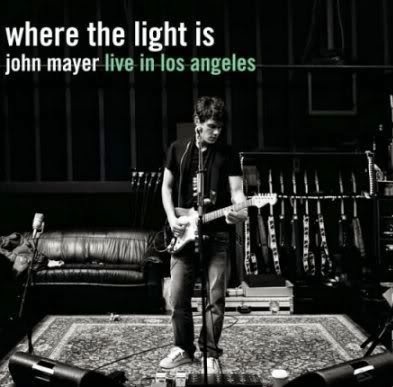 So while the DVD doesn’t offer much intrinsic merit (even ardent fans won’t feel compelled to watch more than once), the CD version of Where The Light Is: Live In Los Angeles is where John Mayer best demonstrates the breadth of his musicianship.